LD- Lock less cylinder, requires Schlage key in lever cylinder. Cylinder not included. BD-Lock prepped for small format (Best type) IC Core. IC core not included. Schlage® NDE series wireless locks with ENGAGE technology are designed to fit into a standard cylindrical door prep. Ideal for interior offices and sensitive storage areas. Up to 5000 users and 2000 event audit trail. Storeroom function less cylinder, valid credential or key momentarily unlocks door. Valid credential may be used to change to a passage or secured state. Inside lever always allows free exit. Easily managed via a mobile app right on a smartphone or tablet. With the free ENGAGE web and mobile apps, it’s easy to configure lock settings, manage users with basic access privileges, and view lock audits & alerts from anywhere. With Wi-Fi built-in, the new NDE Series wireless locks can be configured to connect to a Wi-Fi network to receive automatic daily updates. 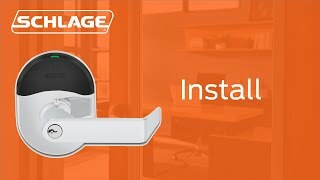 NDE Series wireless locks can also be updated anytime from the ENGAGE mobile app when in Bluetooth range of lock. Works with fobs, smart or prox cards. Battery operated with 4 AA batteries. Handing, right-handed from factory, field reversible. ANSI/BHMA A156.2-2011, Series 4000, Grade 1. For doors 1 5/8" – 2" thick. Strike, standard: 1-1/4" x 4-7/8", ANSI square corner, with Door Position Switch magnets. Operating temperature for interior doors. 32° to 120°F (0° to 49°C). Communication range 50 ft - 100 ft typical with obstructions. Connectivity options, ENGAGE mobile app (update manually, at lock), Wi-Fi access point (update daily), Gateway with ENGAGE technology (real time). ENGAGE mobile app requirements, iOS 7.1 or later on iPhone 4S or newer, Andriod 4.4 (Kit Kat) or later. ENGAGE web app requirements, Internet Explorer 11.0 or late, Chrome 38.0 or later, Firefox 33.0 or later, Safari for Mac OS X 10 +.